I love this design, and yet I find it difficult to envision it worn regularly as a scarf - hence my hesitation to acquire one. But the mosaic display carries me back to the Roman days, and the exquisite art resulting from laying tiny pieces of rock or crystal displaying the craftsmen's both vision and skills (and patience). What appealed to me in particular was the illustrated "unevenness" of the pattern in this scarf, reminding us that laying mosaic tiles is a true form of art. Finally, the design "dissipates" towards the edges, a clear indication of the passing of even the greatest of civilizations. 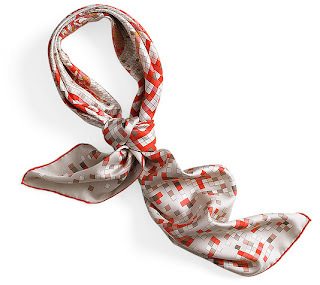 The introduction of this design has coincided with the re-opening of Hermes' flagship boutique at 24, rue du Foubourg St.-Honoré ("24 FSH" for short), following the renovations of the premises. It was then incorporated in the 2008 spring/summer collection. I've been aware of this design for a long time now, and was ecstatic to come across a picture of it earlier this year. 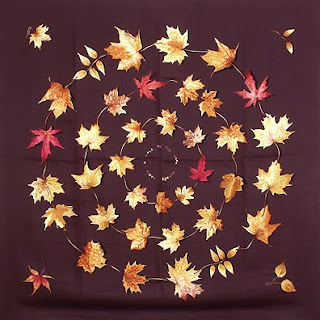 The reason why I find it appealing is threefold: for one, I live in Canada, where the maple leaves (featured on this scarf) are a national symbol. Second, the plum background is a very rich colour that appeals to me. Finally, I love the way the design is very discreet when the scarf is worn. Very elegant, indeed. The colours in this picture are not quite accurate, as most of the leaves feature brighter autumnal shades of yellow, orange and red. But it gives you a sense as to how peaceful this scarf is, indeed deserving "A Walk in the Park" title, by - who else? - Leigh P. Cooke. I was disappointed by two recent designs that this person created - "A vos crayons" and "Berries", which were created in the same style of apparent random position yet the former featured the pencils perpendicular cu the sides, which made it less than appealing when worn (although it did feature pencil sharpening shavings in the middle, which were totally cute! ), whereas the latter was just too busy for my liking. The designer's return to the values intrinsic in this scarf, in 2009, with "Winter Walk", is encouraging as it depicts more outstanding and mesmerizing designs. A review of that design should follow shortly. While spending time in Japan in the summer of 2007, I became aware of the "pearls" of the new collection for the Fall/Winter season, of which "In the Pocket" is a fine example. 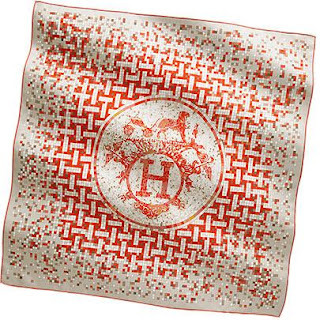 Hermes chooses an annual theme to be explored in the scarf designs , and collections are spread every year over two seasons: Spring/Summer and Fall/Winter. "Shall We Dance" was the 2007's theme, and "In the Pocket" was released later in the year, as part of the Fall/Winter collection. 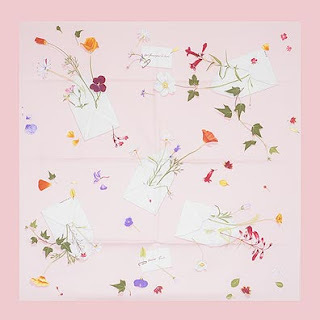 Since the seasons are loosely defined, the scarves in the Spring/Summer edition are released around November of the previous calendar year, while the Fall/Winter scarves hit the boutique shelves in mid-May. The impact that this scarf has had on me is so strong, no other scarf has ever come close to matching it. To date, it remains my all-time favourite for the strong and profound emotions it stirs in me, of reverence, of reflection, of joy and of pure enchantement. So powerful has the impact of this design been, in fact, that I find every colour combination highly desirable (except for the light, pastel green, which is a difficult colour to wear for most people). The baby blue, the pastel pink, the white, the dark green - each adds a different pitch to the harmony of this remarkanble and unforgettable design. Today's post features one variation of this scarf, in "anthracite gray" with an orange hem, which to this day remains one of the most sought-after, wildly admired and collectible scarves the Maison has ever produced. 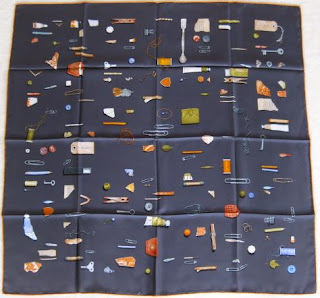 Designed by Leigh P. Cooke (I found out the artist is a male), the scarf has a unique spirit encapsulated by its name beautifully: "in the pocket" features the many objects (and in particular, the remnants of objects, neglected or lost) that we tend to keep - and forget - in our pockets. Treasured mementos that whisper some of the greatest, most remarkable and most memorable moments of our lives. These fragments - buttons, pencil stubs, entry tickets, scraps of paper and coins, the remnants of our lives' feasts - give our lives the profiles we call "character". They find refuge in the silence of our pockets, our bags, our drawers, our memory, yet their murmurs tell stories drawn from our memories. This scarf is a masterful tribute to all those items that bring back the memory of great things past, and which make our hearts race and our minds take refuge in nostalgia. Unlike Galileo Galilei, who had a fascination with symmetry, I treasure equally geometric patterns and apparent disorder. While there's no apparent order in this pattern, the elements of the design, taken as a whole, form a very balanced landscape, infusing a mysterious harmony into the overall scarf. Quite fascinating. This colour combination in particular continues to trigger record sums at private sales, one such scarf having been acquired for close to USD560 in October 2009 (at a time when a new scarf was retailing for USD375). The third design that mesmerized me is a model by a very talented designer in the service of Hermes, Leigh P. Cooke. To my embarrassment, I don't know whether the designer is a "he" or a "she" (I suspect a "he"), and haven't been able to resolve this dilemma neither with the use of the internet, nor with the help of the sales staff at Hermes. Nevertheless, while I continue to be hopeful that one day I'll not only find out but also get to know more about him/her, I continue to treasure the wonderful designs that this person creates. This one, entitled "Des fleurs pour le dire" ("Say It with Flowers") is both impactful and very playful. I got a glance at this one after my trip to Asia in 2007 (I had traveled as a school ambassador to teach business courses at a university in Shanghai, then after this 2-month engagement I visited Beijing, followed by Hong Kong, and when I came across this scarf, I was enroute to Tokyo). As I frequently do, when I come across an object I instantly think of someone in my life who would not only enjoy it, but whom the object would fit "like a glove". So I saw this one and instantly thought of my grandmother, who lives in Romania and thought it would be perfect as the design depicts flowers bursting out of envelopes and we - my Grandma and I - keep in touch by letters regularly. I'll look for another picture where that depicts the contrast better, to illustrate the design in all its splendour !